On Saturday, March 23rd, declared the Vietnam Veterans’ Day by Mayor M. R. Bloomberg. 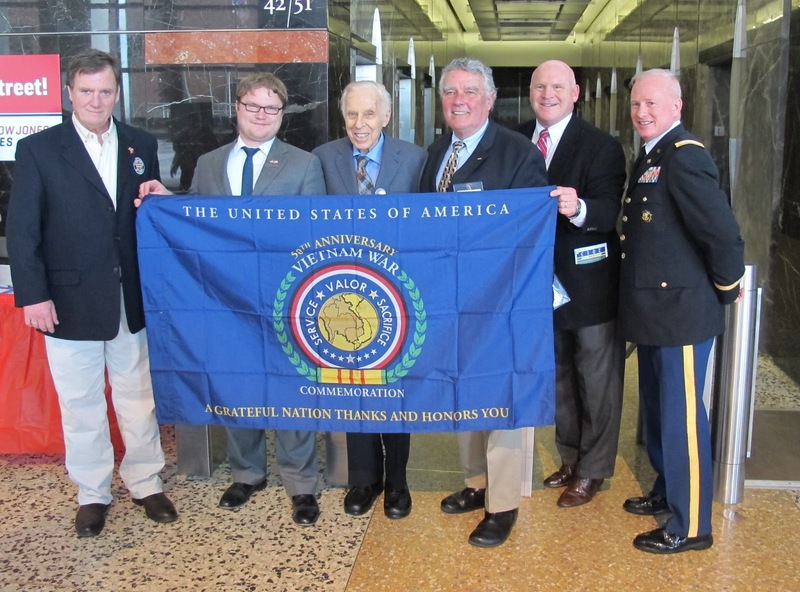 SPI was among those officially recognized as a partner in the Vietnam War Commemoration with a presentation of the commemorative flag. The flag was presented by Lieutenant Colonel, Hunter Holiday, extreme right in this picture (shown from right to left receiving the flag are the members of our Commemoration committee, Kevin Wensing, Captain USN (Ret); Vincent McGowan, Founding President of United War Veteran’s Council; Dr. Herbert Hendin, President and CEO of Suicide Prevention Initiatives; Jason Hansman, Senior Program Manager at Iraq and Afghanistan Veterans of America; Brian Q. Foley, Vietnam War Veteran, Active in Veterans Aid Foundation). Every table at the Luncheon was filled with equal numbers of veterans and non-veteran supporters of SPI. The presentations were powerfully moving and described by some participants as "inspirational". The Life Lines Luncheon honored veterans and provided support for SPI's projects directed to improving the care of veterans with PTSD and preventing suicide among those at risk. Paul Bucha a Medal of Honor recipient, was the Keynote Speaker at the event. Click here to learn about his combat experience. Lee Ann Doerflinger, a Gold Star Mother who lost her son in combat in Iraq, received SPI's Survivor's Award for the support she has given other mothers who experience this tragedy. Dr. William McFarlane received SPI's Research Award for his pioneering work in the development of a Multifamily Psychoeducation program that enables veterans who are alienated from their families to reunite with them. Herbert Hendin, M.D., the founding director of SPI, is its CEO and Medical Director. He directs Healing the Hidden Wounds of War, a project designed to improve the treatment of combat veterans with Posttraumatic Stress Disorder (PTSD) and prevents suicide among those at risk. The project has a particular focus on those who are most at risk. The Bristol-Myers Squibb Foundation has given Dr. Hendin a grant to support his work on preventing suicide among veterans. That work is being carried out at the Michael DeBakey VA Medical Center in Houston Texas. Suicide Prevention Initiatives’ fifth annual Walk for Life in Riverside Park on May 11th will support our progress in improving the care of veterans with Posttraumatic Stress Disorder (PTSD) and preventing suicide among those who are at risk.